There are six design features involved in preparing for PBI Global through which teachers decide the nature of the project. 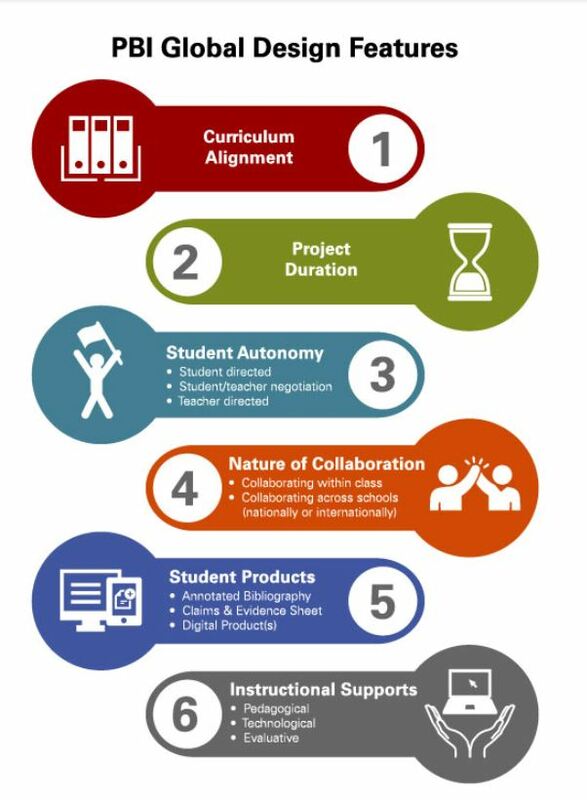 The features include a) curriculum alignment, b) project duration, c) student autonomy, d) nature of collaboration, e) student products, and f) instructional supports. Teachers have many demands on their time, which is why PBI Global is designed on a continuum of complexity. The following features can be used to design a PBI Global that fits the needs of any classroom. To begin designing a PBI Global, teachers should consider the curriculum and standards around which they need to design instruction, as well as a global issue that connects to these instructional drivers. The United Nations has identified 18 key issues for the global community to take up in order to ensure sustainability for future generations, including potable water, refugees, climate change, etc. By focusing on one or more of these themes, students will begin to understand the complexity and interdependence of these issues at an early age, and therefore be more likely to solve these challenges in the future. Furthermore, students can develop the cosmopolitan traits of hospitality and reflexivity when exploring global challenges from the perspectives of other cultures. One potential way to design a PBI Global is to use a common read that revolves around a global theme. For example, teachers may select a book like A Long Walk to Water by Linda Sue Park to spark students’ interest in the topic of global water crises and to develop their understandings of the associated health, conflict, and development issues. Incorporating books written by authors of other cultures is one method teachers can incorporate the transactions of perspectives that helps develop cosmopolitanism. Teachers must also determine the intended duration of the PBI Global. For example, will the PBI Global last for one class period, a week-long unit, or a semester-long process? Educators should consider the instructional plans already in place as well as the complexity of the project. How long will students need to effectively complete the PBI Global? Determining project duration and student autonomy go hand-in-hand when designing PBI Global. Generally, the more autonomy students are given, the longer the project will last, as learners will need added time to make well-informed decisions within the five phases of the PBI process. PBI Global affords a certain level of flexibility when it comes to student autonomy; projects can be student-directed, student-teacher-negotiated, or teacher-directed. For example, are students going to be generating compelling questions, will the teacher generate those questions, or will students and the teacher collaborate? Likewise, when gathering and analyzing sources, will students identify, cite, and summarize sources independently or will there be specific scaffolds to support them in their research, e.g., list of reliable sources, annotated bibliography model, graphic organizer, etc.? The time-frame within which PBI Global is conducted and the learning needs of students will be two important factors in determining the level of student autonomy for the project. It is important to note that student choice within PBI Global and the project’s collaborative nature often serve as motivational tools. Another aspect of complexity within PBI Global is the nature of collaboration. Teachers must consider how extensive collaboration will be as well as the boundaries of collaboration. For example, will students collaborate in groups within the classroom or across classrooms in the same school? Teachers can consider having students collaborate with students from other schools, nationally or internationally. In general, student teams should be comprised of three to five members, based on the prescribed workload for the project. In past PBI Globals, student team members have chosen a specific role within the project, e.g. provocateur, research lead, writing lead, and visual lead. The provocateur is the overall group leader who makes sure that the team is meeting deadlines and serves as the primary communication link between the team, the coach, and the teacher. The research, writing, and visual leads are responsible for organizing and directing the work toward a particular PBI Global product, i.e., the research lead is spearheading the work for the annotated bibliography; the writing lead is primarily responsible for the Claims Sheet; and the visual lead is at the helm for the digital product. The teacher needs to make sure that student teams understand that being a lead does not mean that the person is the only one working on and responsible for a specific product; a lead’s role is to organize and coordinate daily working arrangements toward completion of a product. When students work together on PBI Global across cultures, learners build collaborative skills that will add to their global intellectual capital, enabling them to be world-class leaders of today and tomorrow. Students are able to engage in intercultural dialogue to build cosmopolitanism. Connecting classrooms internationally does increase complexity for all three stages, i.e., design, implementation, and extension, of the project. Time differences and technological connectivity can make collaboration - both synchronous and asynchronous - more challenging. However, the cross-cultural relationships that students build as they engage in the PBI Global process are nothing short of life-altering and vital to developing cosmopolitanism. When designing PBI Global, teachers must decide which items they will require their students to produce as final products for the project. For example, in past PBI Globals, students have produced annotated bibliographies, a finalized Claims Sheet, and digital products, such as videos or infographics. Students often need assistance with creating the products. We have employed older students to work as PBI Global coaches who aid younger students. As noted above, the more complexity embedded in project design, the greater the supports needed for students to successfully engage in the PBI Global process. We have divided instructional supports into three categories: pedagogical, technological, and evaluative. In terms of pedagogical supports, the teacher needs to consider what materials, knowledge, and skills will be utilized by students during PBI Global and what resources are necessary to guide students toward successful completion of their inquiry. Materials may include instructional scaffolds, such as an annotated bibliography graphic organizer and a Claims Sheet template. The role of PBI Global coaches and making intentional decisions about how student groups are composed are other examples of pedagogical scaffolds. Pedagogical scaffolds also work in conjunction with technological and evaluative supports. For example, the teacher may identify that students need a collaborative digital space for research and writing and establishes team folders on Quip, an online document sharing tool. Creating a mini-lesson that teaches students how to use Quip acts as a pedagogical support while Quip serves as a technological support, allowing students to compile and write collaboratively in real time. In terms of evaluative supports, providing students with a PBI Global rubric at the onset of the project, conducting benchmark check-ins with student teams, and incorporating feedback from external content experts are all tools that aid in setting expectations and formatively assessing students during the PBI Global process. The coordination of instructional supports before and during PBI Global is undoubtedly the most complicated aspect of project design and implementation. To distribute the load, it is essential for the PBI Global lead teacher to assemble a cadre of support personnel, including co-teachers, PBI Global coaches, and external content area experts. By clearly defining the teacher support team’s roles and responsibilities during the project design stage, the role of the teacher can more easily transition to that of facilitator during the implementation and extension stages.